Can Tesla Shares Make a U-Turn After $500 Million Lifeline? Traders have been put on high alert as Tesla announced a $500 million credit line for its troubled Shanghai Gigafactory. It comes at an important time for Tesla as their share price struggles from a raft of recent negative headlines over their China expansion, as well as concerns over Tesla's car safety record and the role of maverick CEO, Elon Musk. 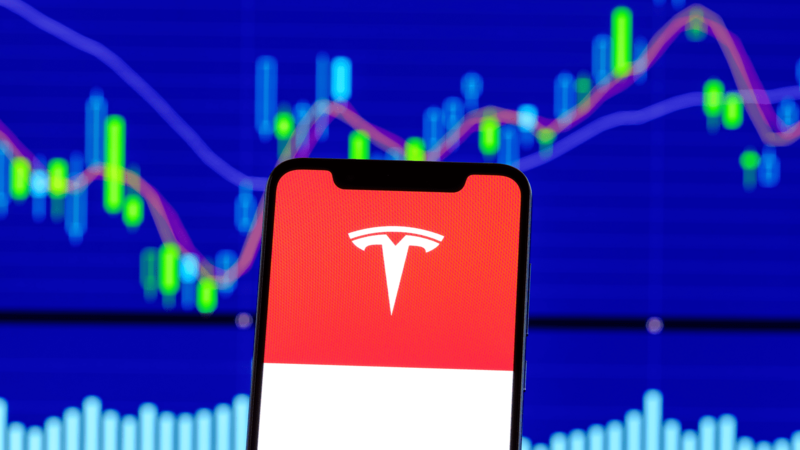 Shares in Tesla have subsequently crashed nearly 30% between December 14, 2018, to March 5, 2019. During this same time period, the S&P 500 stock market index rose by roughly 6%. However, some traders - such as the notorious short seller, Andrew Left - have suddenly turned bullish on Tesla shares. Is it time for a u-turn in the stock price? Let's take a look. Source: Admiral Markets MT5 Supreme Edition, Tesla, Weekly - Data range: from February 13, 2011, to March 11, 2019, accessed on March 11, 2019, at 5:53 pm GMT. - Please note: Past performance is not a reliable indicator of future results. In the above chart of Tesla's share price, it is clear to see that while the price has risen over time, there have been periods of huge volatile price swings. It appears as though the bulls and bears of the market are in a big battle to take control. This is understandable, as analyst views and price targets for the stock vary wildly. Andrew Left of Citron Research is calling for Tesla stock to rebound to $320, due to the company's $500 million credit line and new upcoming products. However, Adam Jonas at Morgan Stanley updated their investors with a 'something just doesn't add up' statement. This is in reference to why Tesla has not yet raised any capital and whether or not the company's balance sheet can pay its upcoming debt obligations. Interestingly, a survey of 28 investment bank and research houses show a maximum price target of a whopping $530 and the lowest price target of just $192. It seems as though Wall Street is struggling to find consensus on the future price direction of Tesla. However, this is not necessarily a bad thing for the active trader. 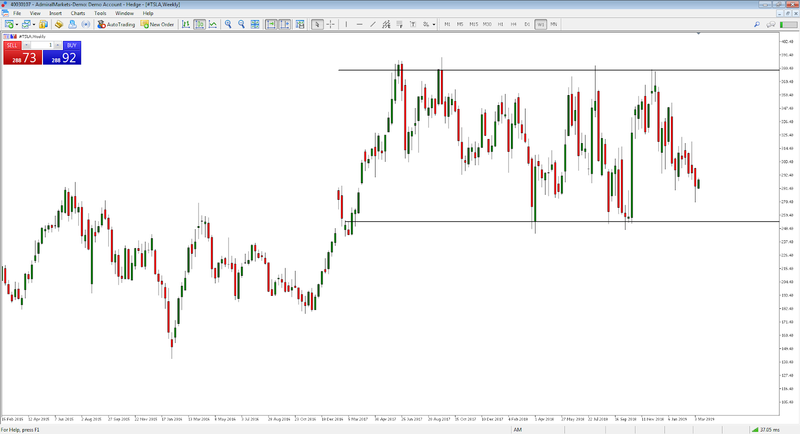 These 'range based' markets can sometimes offer good reward to risk trading opportunities as we discuss next. A range-based market typically occurs when the view of bulls and bears vary wildly but with not much conviction. 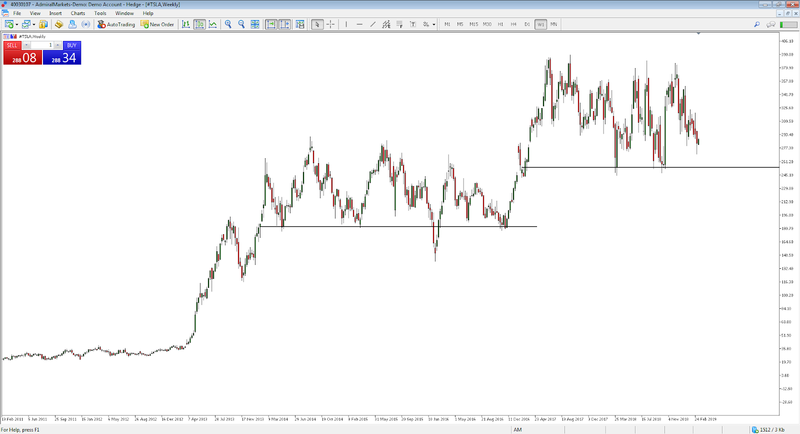 In these scenarios, a stock often trades between historical price levels such as horizontal support and resistance. Source: Admiral Markets MT5 Supreme Edition, Tesla, Weekly - Data range: from February 15, 2015, to March 11, 2019, accessed on March 11, 2019, at 6:22 pm GMT. - Please note: Past performance is not a reliable indicator of future results. In the chart above, it is clear to see that shares in Tesla are trading in between two distinct price levels as shown by the two horizontal black lines, forming upper resistance and lower support levels. Traders will often trade off these levels using price action patterns, such as pin bar reversals. Source: Admiral Markets MT5 Supreme Edition, Tesla, Weekly - Data range: from March 5, 2017, to March 11, 2019, accessed on March 11, 2019, at 6:32 pm GMT. - Please note: Past performance is not a reliable indicator of future results. 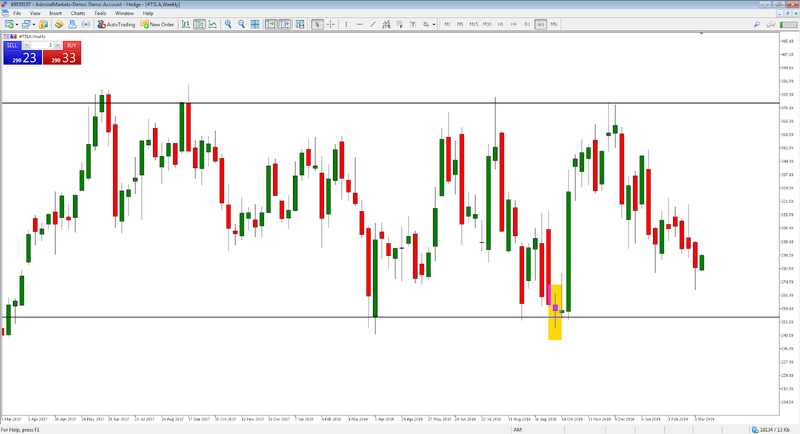 In this weekly chart of Tesla's share price, the yellow box shows a bullish pin bar reversal, also known as a 'hammer candle', which formed at a significant horizontal support level. The bullish pin bar represents a failure of sellers to break through - and close below - the horizontal support level, with buyers retaking control by pushing the market back up. Traders could enter on the break of the pin bar's high at $267.68. A stop loss could have been placed at the pin bar's low at $247.47. Trading at the lowest lot value for US share CFDs of 1 lot, then if the entry price was triggered and then went to hit the stop loss, the trader would have lost approximately $101.05. In this instance, the stop loss was not hit. If the trader held their position until the horizontal resistance line at $378.5, the trade would have been exited on the week of December 2, 2018, and would have resulted in an approximate profit of $554.45. Are you keen to experiment with your own trading ideas? Then sign up for a free demo account to trade in a risk-free environment. Each of the Analysis is prepared by an independent analyst (Jitan Solanki, Professional Trader and Analyst, hereinafter "Author") based on the Author's personal estimations.